Bluffton’s Collin Oglesbee (left) and Continental’s Westin Okuley compete for the ball during Wednesday’s Division III district semifinal match at Kalida High School. Continental’s Wyatt Davis dribbles ahead of Bluffton’s Tayton Kleman during Wednesday’s Division III district semifinal match at Kalida High School. 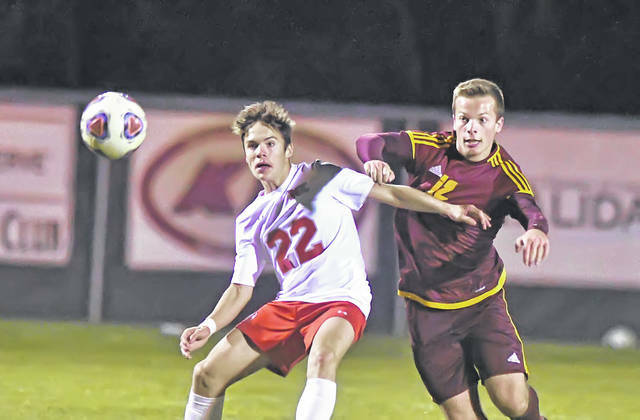 New Knoxville’s Jose Rabadan, left, and Kalida’s Cameron Siebeneck compete for the ball during Wednesday’s Division III district semifinal match at Kalida High School. KALIDA – Continental knew it had to put constant pressure on No. 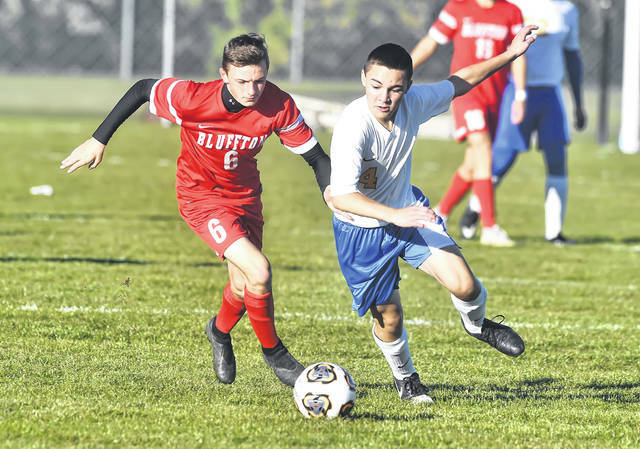 1 seed Bluffton in Wednesday’s Division III district semifinal boys’ soccer game. For most of the night, Continental’s ploy worked. However, Bluffton’s ample opportunities around the goal finally paid dividends. Of the 14 shots on goal, Bluffton managed to get two of those to slip into the back of the net. However, that was all Bluffton needed, en route to a 2-0 win over Continental Wednesday night. With the victory, Bluffton (12-2-4) advances to Saturday’s district championship matchup against No. 2 seed Kalida (8-3-6). Game time is set for 2 p.m. at Kalida. Kalida won Wednesday’s other semifinal over New Knoxville, 7-3. After three good looks at the goal in the first half, Bluffton finally broke the silence with 13:31 left to play. Luke Young took a shot around the 18, and pushed it past Continental goalkeeper Trevor Brecht (12 saves) for the first goal of the game. On the night, Young took a total of four shots on goal – all in the first half. “I was just happy I got one in, because after missing shot after shot, it gets frustrating,” Young said. Bluffton mustered six shots on goal in the first half, and held a 1-0 lead at the halftime break. Continental (9-8-2) made Bluffton work hard in its effort to push the ball past its defenders. Bluffton struck again, midway through the second half. Jude Spallinger took a nice feed from Tayton Kleman inside the box and drove it past Brecht to give Bluffton the two-goal lead. “We changed our shape in the second half,” Smucker said. “I don’t know if that helped us a whole lot. There were some individual efforts. For the game, Continental managed to take just four shots on goal. Kalida took a quick lead over New Knoxville and eventually pulled away for the semifinal victory. Kalida’s Grant Laudick scored the first three goals of the game, as the Wildcats led 3-0, early on. However, New Knoxville battled back and by the halftime break, Kalida’s lead was 4-2. Jose Rabadan and Joseph Baende scored for the Rangers. Early into the second half, Kalida’s Josh Verhoff scored inside the box to push the lead to 5-2. Then, less than 10 minutes into the second half, Verhoff added another goal off a header, pushing the Kalida advantage to 6-2. At the 18:34 mark, Zach Davis scored off a long-range shot, cutting the deficit to 6-3. At the 16:10 mark of the second half, Kalida’s Brad Siefker scored off a header to round out the scoring. https://www.limaohio.com/wp-content/uploads/sites/54/2018/10/web1_Bluffton-vs-Continental-RP-002.jpgBluffton’s Collin Oglesbee (left) and Continental’s Westin Okuley compete for the ball during Wednesday’s Division III district semifinal match at Kalida High School. https://www.limaohio.com/wp-content/uploads/sites/54/2018/10/web1_Bluffton-vs-Continental-RP-005.jpgContinental’s Wyatt Davis dribbles ahead of Bluffton’s Tayton Kleman during Wednesday’s Division III district semifinal match at Kalida High School. 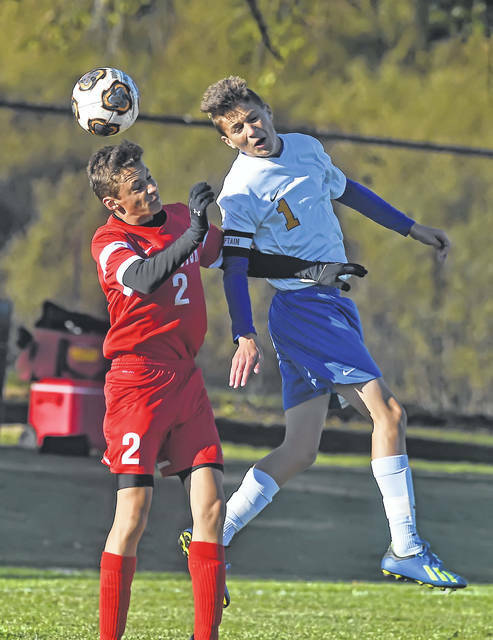 https://www.limaohio.com/wp-content/uploads/sites/54/2018/10/web1_Kalida-vs-New-Knoxville-RP-004.jpgNew Knoxville’s Jose Rabadan, left, and Kalida’s Cameron Siebeneck compete for the ball during Wednesday’s Division III district semifinal match at Kalida High School.